SAS Financial Management is a comprehensive solution for enterprise planning, budgeting, consolidation, and reporting. This course provides a review of SAS Financial Management and its interfaces, including SAS Financial Management Studio, SAS Financial Management Add-In for Microsoft Excel, and SAS Financial Management web applications. You learn how to create and publish financial reports that comply with regulatory requirements and to analyze financial results using real-time information and on-demand consolidation. You also learn how to develop and manage operational plans, generate financial forecasts, and create financial budgets. Note that this course covers in five days the topics from the SAS® Financial Management: Financial Reporting and SAS® Financial Management: Financial Planning courses. Update and maintain SAS Financial Management dimensions. Work with multiple exchange rates. Automate core financial computations, including intercompany eliminations, manual and rule-based journal adjustments, and currency translation adjustment. Create and access shared reports. Update and maintain the Forms workspace. Create and manage multiple forecasts and budgets with different workflows. Use rates to forecast scenarios. Introduction to the SAS Financial Management web applications. SAS Financial Management Add-In for Microsoft Excel. 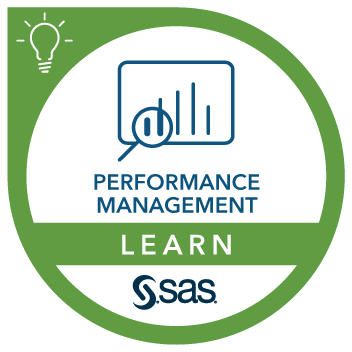 Introduction to SAS Financial Management Studio. SAS Management Console: groups, roles, and capabilities. SAS Financial Management Studio: setting security. Overview of the Dimensions workspace. Data locales and calendar templates. Organization and Trader dimension types. Time and Frequency dimension types. Creating and publishing a read-only table. Changing the layout of a table. Overview of cell data access (CDA) tables. Building an initial CDA table. Designing a report with a CDA table. Overview of cycles and the Periods workspace. Working with exchange rate sets and exchange rates. Overview of the model adjustment process. Account types and frequency conversion. SAS Financial Management Studio - Forms workspace. Creating a phase, form set, and forms. Assigning form authors and reviewers. Publishing the form set and understanding form set and form status values. Performing tasks in the Forms workspace. Creating a basic form template. Member selection rules and writable descendants. Allow data entry at parent members. Validating data in a form. Introduction to the Web Forms workspace. Managing forms in the Web Forms workspace. Entering data into a form’s writable cell. Creating a financial form set with bottom-up workflow. Designing a form template and publishing a form set. Overview of driver rates in the Rates workspace. Creating driver rate sets and loading driver rates. Building a formula using a driver rate.